An older woman collapses into the arms of a stoic young soldier-to-be, their farewell watched by dozens of fellow peasants inside the crowded barn. Hanging alongside this massive canvas, a smaller painting is suffused in the crisp light of a clear winter's day. The picture shows two boys, one wearing an over-sized army coat and hat, beside a freshly dug grave. Its title: "Orphaned." The juxtaposition, though not entirely unexpected, caused me to gasp slightly, experiencing the rush of emotions that good -- and well-curated -- art can provoke. Wrenching moments are not in short supply in "Scenes from Tsarist Russia," one of the current shows at Istanbul's excellent Pera Museum. 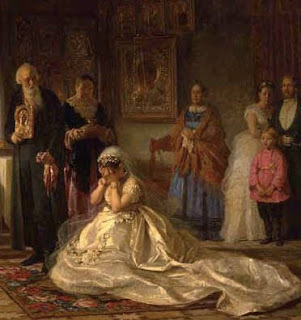 A bride sobs, covering her face in her hands, on her wedding day to a much older man. Families escape with a few scant belongings from a village fire. A dying woman sits in a garden, staring off into the distance. Other paintings draw a smile: women celebrating a rural "hen night," a boy being distracted from his studies by the sight of a girl in the window across the way. Though the local media has been falling all over itself to herald the Pera's other current exhibit, "Frida Kahlo and Diego Rivera," people in the know had told me the 19th-century realist paintings from the State Russian Museum were the real find. Many were powerful indeed, combining fine brushwork with emotional sensitivity. But the fiery stars of 20th-century Mexican art are worth spending time with as well, even if you think you're already very familiar with their work. 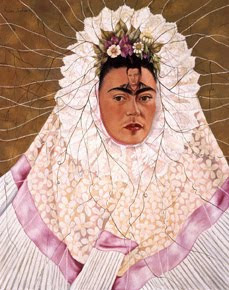 The show, though small, artfully juxtaposes examples of Frida's famous self-portraits with photographs, including some gorgeous shots by one of her lovers, that shed some light on how the way she perceived -- or wanted to portray -- herself both matched and differed from reality. Perhaps most moving is a sketch Frida made after a miscarriage, showing the lost child outside her body but still tethered to it, tears streaming from her womb. TO VISIT: Both exhibits are on view until March 20 at the Pera Museum in Istanbul's Beyoğlu district. The museum is open Tuesday through Saturday from 10 a.m. to 7 p.m. and Sunday from noon to 6 p.m. For the duration of these two shows, it will also stay open until 8:30 p.m. on Fridays. General admission is 10 Turkish Liras.